In a clash between two great defenses, the home team scored the lone goal of the match to earn their third straight win. 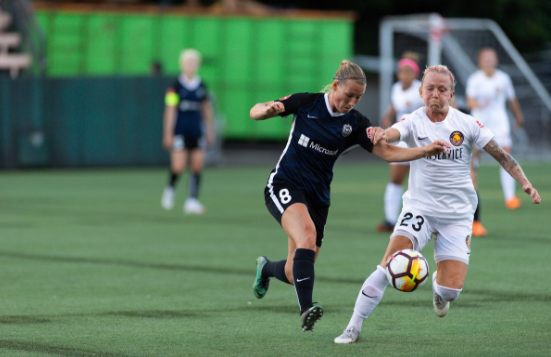 Seattle Reign FC got a goal off the head of midfielder Megan Rapinoe to earn the 1-0 win over Utah Royals FC on Wednesday night. With the win, the Reign remain in second place on the league table, and they are now four points clear of the Orlando Pride who sit in third place. Seattle is riding a three-game winning streak that pushed them back into second place. Seattle remains, numerically, the strongest defensive team in the league. They did not allow a single shot on target in this match, and the team has allowed just 13 goals in 16 games played. Despite the addition of Christen Press to the lineup a few weeks back, the Royals' offense is still much maligned. Utah has been shut out in four of their last five matches, with their only goals coming in a 3-1 victory over Sky Blue FC. The team is having trouble generating quality scoring opportunities, as was shown by the zero shots on goal for Utah in the match. To their credit, the URFC defense played extremely well. They allowed just one shot on goal, but it found the back of the net. The game got off to a chippy start with two Royals booked in the first half. Defender Samantha Johnson was carded in the 12th minute while defender Rachel Corsie received hers in first-half stoppage time. Seattle midfielder Allie Long received a booking of her own immediately after Corsie, and the first half ended scoreless but with plenty of information on the scoresheet. Seattle was aggressive early in the second half, and they would convert a corner kick into the lone goal of the night. Rapinoe's positioning shines in the play. She started off marking the back post, but the kick from Steph Catley floats on her. Rapinoe curled behind the defenders, rose up and sent a high, arching header over the outstretched hands of Utah goalkeeper Abby Smith and into the side netting of the goal. The goal was Rapinoe's seventh of the season, and she sits in a logjam of players just behind Sam Kerr in the race for the Golden Boot. Utah hosts Orlando on Saturday night while Seattle travels to face the Chicago Red Stars.